- Sell your existing iPhone and buy the latest one. - Give your iPhone to someone else. - Improve your mobile phone performance. - Free up more storage. - Just want to delete some privacy things. When it comes to deleting data on the iPhone, many people will first think of restoring the iPhone device to factory settings. However, if you forget your password, is it possible to erase iPhone without passcode? Now, since most iPhone users keep fingerprints unlocked on the iPhone, passwords are often easily forgotten. However, if you want to reset the iPhone to factory settings to eliminate all data, you still need a password. So, in this article, you will learn how to erase iPhone data without a password. 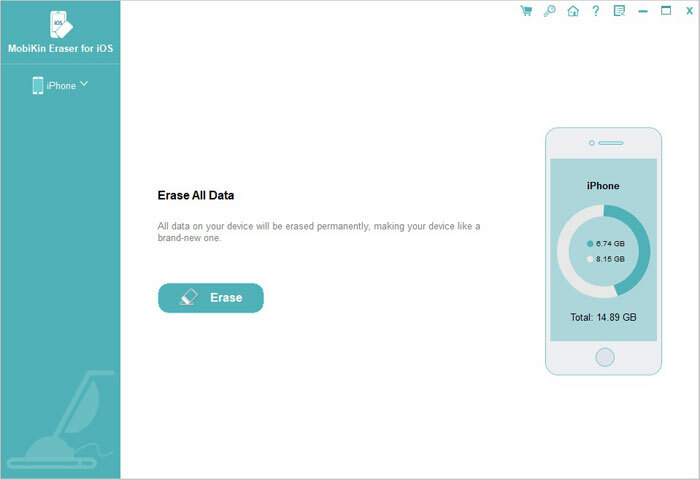 First of all, we would like to introduce a professional iPhone/iPad data erasing program called MobiKin Eraser for iOS (Windows/Mac) to help you permanently erase data from iPhone and iPad, and prevent them from being recovered again. 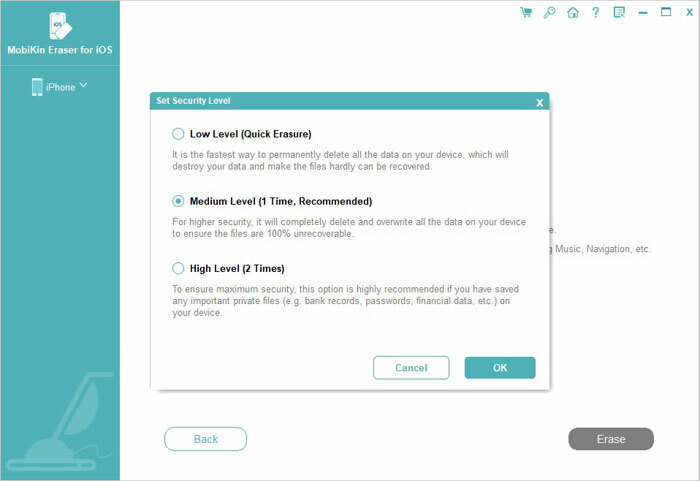 As you know, normal factory reset can't erase data permanently because other people get a professional data recovery tool like this Doctor for iOS, they can easily get your deleted files back. Eraser for iOS can erase data with 100% unrecoverable by any hack tool. Therefore, if you want to secure your personal information on your iPhone and iPad, MobiKin Eraser for iOS is your best choice. The data types that can be erased by this program includes contacts, messages, photos, videos, apps and many more. All devices of iPhone, iPad and iPod can be perfectly supported. Just download the program and give it a try by yourself! Step 1. After you have downloaded and installed the Eraser for iOS program, launch it on the computer and then link your iPhone or iPad to the same computer via the USB cord. Step 2. After the connection, you can tap on "Erase" button on the interface to enter the erasing window. After that, you can tap on "Medium", which would bring up the "Select Security Level" window. Step 3. Choose the right erasing mode according to your need. Here we suggest you directly choose the "Medium" level as default. After that, you need to type in "Delete" in the input box and click on "Erase" button to begin the erasing process on your iPhone. Please do not plug out your iPhone or iPad during the erasing process. Now, just wait patiently for the process to get completed within a little while. Till now, you have successfully deleted everything on iPhone and they won't be recovered no matter which recovery tool you are using. If you have ever synced your iPhone or iPad with iTunes before, you can follow the steps as below to erase iPhone data without password via iTunes. 1. Link your iPhone or iPad to computer by using an Apple provided USB cable. 2. Launch iTunes on your computer and turn to the upper left corner on iTunes' window to click on the device tab. 3. On the new window, choose "Restore iPhone" and then follow the pop-up instructions to erase iPhone without password. 1. Go to visit the page of iCloud.com/find and log in with your account information. 2. Navigate to the top part of the browser to choose the "All Devices" option. 3. Choose your iPhone or iPad and tap on "Erase Device" button to wipe out this device, as well as its passcode. 4. After you have finished the steps above, your device will be ready for restoration from a backup. 1. Use a USB cable to connect your iPhone or iPad to your computer. 2. Launch iTunes on this computer. 3. Once your iDevice is connected to the computer successfully, you should do a "Hard Reset" on the device. ( If you don't know how to do it, you can refer to the guide: How to hard reset your iPhone? 4. When you see the "Recover mode" screen appears on the phone screen, you should turn to the computer and click "Restore" option. 5. 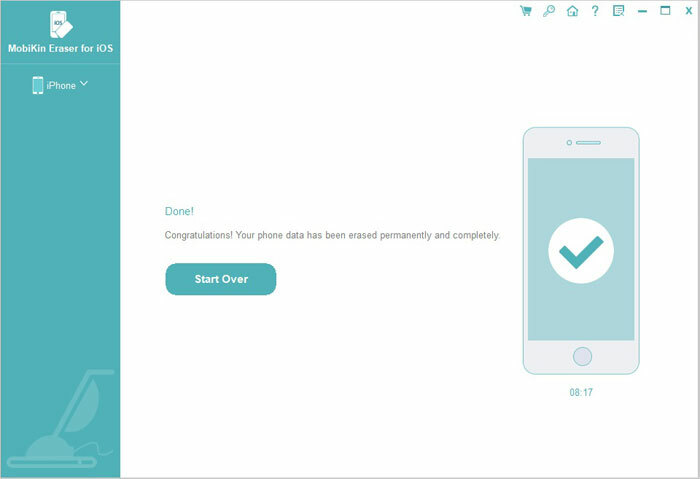 Now, the data erasing process will begin on your iPhone or iPad and the whole process will be finished within 15 minutes. Bonus: Back up iPhone Data before the Erasing Job! No matter which method you use to clean your iPhone, don't forget the most important thing: back up the files on the iPhone that you think are important. Reference article: how to back up iPhone data.